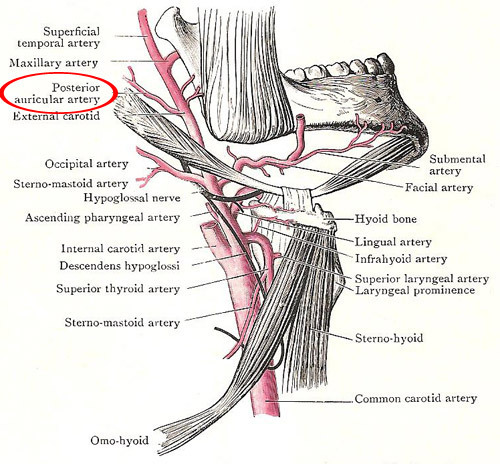 The posterior auricular artery in relation to the external carotid and its branches. The posterior auricular artery is a small artery that arises from the back of the external carotid artery above the level of the posterior belly of the digastric. It reaches the interval between the mastoid process (see mastoid bone). It reaches the interval between the mastoid process and the back of the auricle, and then accompanies the posterior auricular nerve. Besides twigs to muscles and to the parotid gland, it gives off the stylomastoid artery, which enters the stylomastoid foramen to be distributed in the interior of the temporal bone.